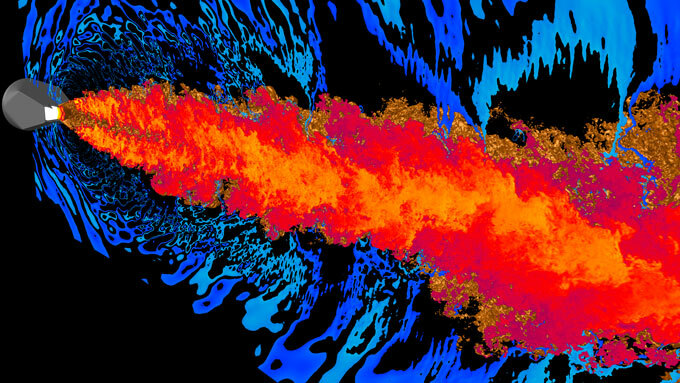 CFD results from Stanford’s 1.5 million core simulation. Exhaust gas temperatures are shown in red and orange, sound field in blue. Image from Stanford U. The GPU Technology Conference (18-21 March, San Jose) features several CFD-related papers including one from Symscape about GPU acceleration of a legacy CFD code. ThermoAnalytics’ RadTherm UGM will be held 19-21 February in Munich. The 14th Asian Congress of Fluid Mechanics will be held on 15-19 October 2013 in Hanoi and Halong, Vietnam. Quantification of Uncertainties in Modeling and Predictive Simulation of Fluids will be held 10-11 October 2013 in Munich. NAFEMS is offering a Practical Introduction to CFD in Hampton, Virginia on 27 March 2013. The abstract deadline for the Symposium on Trends in Unstructured Mesh Generation (to be held in concert with the U.S. National Congress on Computational Mechanics in Raleigh, North Carolina on 22-25 July 2013) is 15 February. The Code_Saturne User Meeting will be held in Chatou, France on 9 April 2013. Distene’s MeshGems suite of embeddable meshing technology is now included in intrinSIM’s product portfolio. Did you know you can get a version of Mathcad Express for free forever? Just sign up for a free 30-day evaluation but when that ends the software remains yours to use forever. EnSight 10.0.2h (a bug fix release) is now available from CEI for CFD visualization and postprocessing. Owens Illinois, a manufacturer of glass containers, seeks to hire a CFD Melting Engineer in Perrysburg, Ohio. Symscape posted an article about the aerodynamics of F-1 cars. From Aerospace American comes this article on supersonic airliners: SST Research: Breaking New Barriers. Lewis Carroll, best known for authoring Alice’s Adventures in Wonderland, proves that he doesn’t understand fluid mechanics. I used to be happy just to get a CFD solution to converge. So how would you like to win an Academy Award for your work? Fluid researchers from Cornell and ETH Zurich will be awarded with a “Tech Oscar” for their work on wavelet turbulence software used to simulate smoke in Hollywood blockbusters like Avatar, Battleship (and the upcoming) Iron Man 3. Read the coverage from ISGTW, NSF, Cornell, and AMPAS. 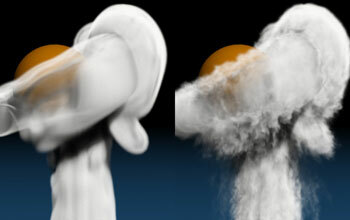 Oscar-winning smoke effects produced by wavelet turbulence software. Image from International Science Grid This Week. Smoke simulations without (left) and with (right) wavelet turbulence. Image from nsf.gov. This entry was posted in Applications, Events, News, Software and tagged CEI, Code_Saturne, Distene, EnSight, GPU, intrinSIM, jobs, Mathcad, MeshGems, RadTherm, Symscape, ThermoAnalytics. Bookmark the permalink.